A rhythm game in which you play along with pop music by tapping, dragging, and spinning on-screen targets at the right time. It is essentially an Americanized version of the Osu! Tatakae! Ouendan games by the same developer released in Japan. The titular agents are essentially a government agency of cheerleaders - when someone has a personal crisis and calls on the agents for help, they show up and dance to motivate the person to succeed. 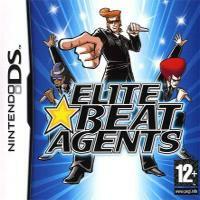 As you play the song, you’re shown both the agents’ dance moves as well as the progress of the person they’re helping. Each song has a few checkpoints where the person will succeed or fail based on the player’s performance leading to a few different possible endings for each song. Befitting the absurdity of the premise, most songs’ stories are humorously over the top. There are four difficulty levels and a total of ninteen songs that each have their own story (though note that this was before Guitar Hero showed record labels how much money they could make licensing their songs for rhythm games, so they’re all cover versions). There are also wireless multiplayer modes, including competing on score and playing cooperatively by taking turns on a song. Gameplay works like this: note markers appear on the touch screen in time with the music, and hitting them with good timing increases your score and fills the “Elite-O-Meter.” Missing notes breaks your combo and drains the meter, which also drains at a constant rate as the song progresses. If the meter ever becomes completely empty, you fail the song. This mostly works great, though the scoring system has a few balance issues - longer combos grant higher score multipliers without limit, so missing a note in the middle of the song hurts your score far more than missing one at the beginning or end. Additionally, the constant draining of the Elite-O-Meter means that it’s much easier to fail slow sections of a song, and the fact that it drains faster on higher difficulties means that challenge and strictness increase simultaneously as note patterns become faster and more complex and fewer misses are allowed before failing. Any frustrations with the scoring system are absolutely dwarfed by the game’s positives, however. The note patterns are well-designed and do a great job of pulling the player into the flow of the song. The cheerful and uplifting atmosphere and amusing stories of triumph in the face of adversity make each mission engaging and satisfying, with the final one being a particularly standout example. This game single-handedly justifies the existence of the DS and it’s the reason I bought one. I Stopped Playing When: I got high enough scores on every difficulty level to achieve the top Agent Rank and unlock all gallery items and other extras. I kept playing for a while after that, but there’s only so many times you can play the same nineteen songs. It’s a true shame there haven’t been any sequels.